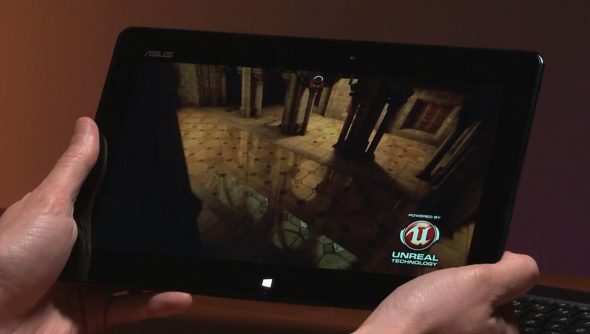 Nvidia have posted a video demonstrating that not only have they got Unreal 3 engine working on Windows RT, the tablet branch of Windows 8, but it’s running without concessions, unlike the version running on Android and iOS. The demo is running on the Asus Vivo Tab, which also has a Nvidia Tegra 3 card inside it. The demo itself is running at between 35 and 40 FPS; impressive considering it’s a chunk of computing thinner than my fingers. Although that just makes me worried I’d drop it all the time. Even more interesting is that Unreal 3 is free for Indie developers to develop in, and the licensing terms are pretty friendly for small studios. That couldmean we could have a new influxof indie developers making games that look very pretty specifically for tablets. Windows 8 is slated for release on October 29th. Not that we think it’s all that good for Desktops.